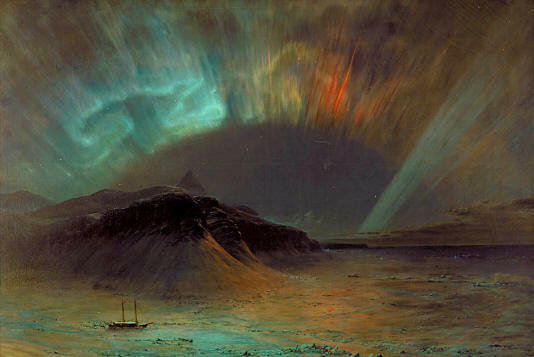 Aurora Borealis by Frederic Edwin Church (1865). Smithsonian American Art Museum, Washington, United States of America. To eyewitnesses, including those at lower latitudes, highly energetic formations produced by extremely vigorous aurorae have often suggested some form of painting or supernatural inscription on the canvas of the sky. 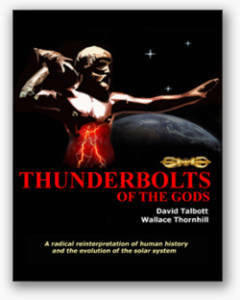 Tromholt’s writings exude a striking sense of intellectual honesty regarding the boundaries of current understanding. 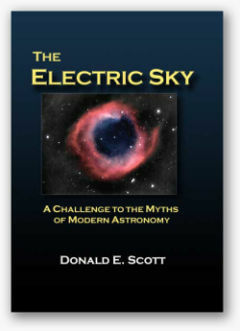 By ‘decipherment’ of auroral “characters” in the sky Tromholt clearly meant a figuring out of the physics underlying the shapes and colours that presented themselves to the eye. With the passing of more than a century, this task has been largely accomplished by today’s plasma physicists. 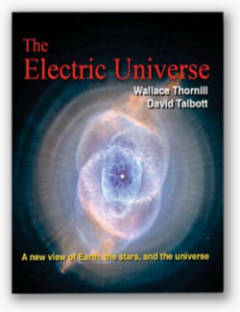 At the same time, Tromholt’s words convey the sense of numinous awe many have felt upon exposure to this celestial drama. Considering the marked emotional impact powerful aurorae tend to have on human minds, it would not be surprising if the appearance of discreet light structures in the sky had provoked similar associations with painting in people of prehistoric times. Seemingly charged with religious significance, these ‘cosmic fingerprints’, in which many strove to read omens for the future, could have prompted human spectators to record their observations for posterity. What would have been more natural for them than to mimic the art of the ‘gods’ to the best of their ability – painting or carving the selfsame images on a darker background, perhaps leaving colours that were reminiscent of the auroral prototypes themselves? Arguably the most obvious type of enduring canvas ancient artists could resort to would be parietal – the surfaces of walls and rocks, which are found today to be filled with millions upon millions of paintings and carvings. Moving beyond speculation, a recent comparison with the observed behaviour of high-energy-density plasmas in laboratory, in space and according to particle-in-cell (PIC) simulations suggests that not only some of the French and Spanish cave paintings of the Cro-Magnon era may include auroral motifs, but also the worldwide impressions on rock, typically exposed to the open air, that proliferated from the end of the Palaeolithic and throughout the Neolithic period, roughly from 11,000 BCE to 3,000 BCE, though in many places continuing into later periods. Rupestral art as a whole appears as one monolithic witness to the possibility that awe-inspiring plasma filaments painted their characteristic nonfigurative images in the firmament first.